Here you’ll find sundry written works in a variety of voices, styles, forums, and forms. Review of The Amplification of Souls. The Wire, January 2015. “The Freedom of Dutch Bubbling.” The Wire, December 2014.
Review of Tropicalia: Ou Panis Et Circencis. The Wire, September 2014.
Review of Rolê – Novos Sons Do Brasil. The Wire, July 2014.
Review of Salvadora Robot. The Wire, June 2014.
Review of Beyond Addis. The Wire, May 2014. “Digital Rhythm: The Loopy Origins of Dembow and Reggaeton’s Knotty Dancehall Roots.” Wax Poetics, 28 January 2014.
Review of Ayobaness! The Sound of South African House. The Wire, June 2010. “Trading in Futures: From Rastas in Space to Dreadlocked Aliens, and Back.” Woofah, Spring 2010.
Review of Dancehall: The Rise Of Jamaican Dancehall Culture (Vol. 2). 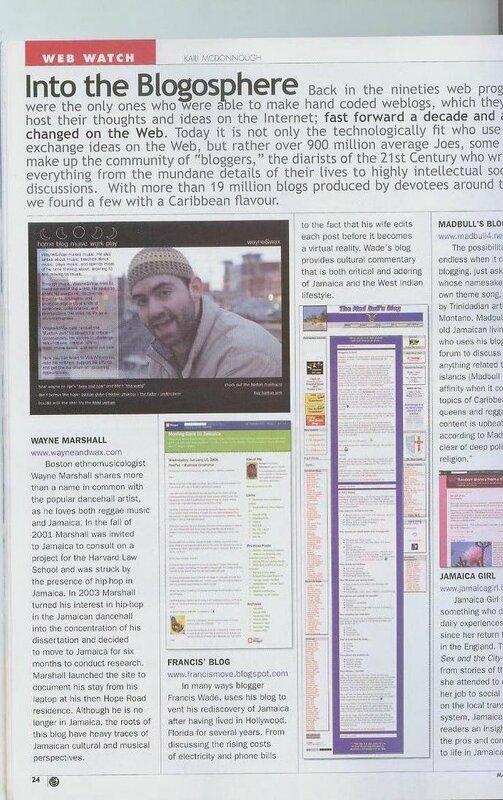 The Wire, February 2010.
Review of Funky Nassau. The Fader, April 2008.
Review of Pitbull’s El Mariel. Boston Phoenix, 18 January 2007.
Review of Specialty Records Reissue Series. Boston Phoenix, 4 January 2007.
Review of New Reissues in Heartbeat’s Studio One Series. Boston Phoenix, 7 December 2006.
Review of Tego Calderon’s The Underdog / El Subestimado. Boston Phoenix, 19 October 2006. “The Rise of Reggaeton.” Boston Phoenix, 19 January 2006. “Reggae-Tinged Resonances of a Wicked Wicked City.” Sonic Heart 1, no. 3 (July 2005). “War Ina Babylon: Jamaica and the War on Terror.” XLR8R, August 2005. I’ve taught courses on music, culture, and society at MIT, Harvard, University of Chicago, Brandeis, Brown, Berklee, UMass-Boston, and UW-Madison. Here are links to several syllabi — some as HTML/blogposts, some as pdfs. Musical Publics. Harvard University, Spring 2013. Technomusicology. Harvard University, Fall 2012. Music, Race and Nation. Harvard University, Fall 2012. Music Industry and Digital Youth Culture. Massachusetts Institute of Technology, Spring 2011. Global Reggae. Massachusetts Institute of Technology, Fall 2010. Global Hip-hop. Brandeis University, Spring 2008. Introduction to World Music. University of Chicago, Winter 2007. Introduction to the Social and Cultural Study of Music. University of Chicago, Autumn 2006. “Doctor Dread.” By Gervase de Wilde. Undercover, no. 23 (May 2005). “Marshall’s Plan.” By Renee Graham. Boston Globe (29 July 2005). “The Boston Jerk.” By Camille Dodero. Boston Phoenix (26 August 2005). “Boston Bounce.” By Nick Barat. The Fader, no. 33 (October 2005). “Into the Blogosphere.” By Kaili McDonnough. Skywritings (Air Jamaica’s Magazine), Spring 2006. “Un ethnomusicologue aux platines.” By Étienne Côté-Paluck. Le Devoir (French), 15 June 2007. “Watch My Meme: How the Web is changing black youth culture, and vice versa.” By Miles Raymer. Chicago Reader, 16 October 2008. “State of the World: How Globalistas Are Tearing Down Cultural Barriers.” By David Dacks. Exclaim!, March 2009. “Digital Underground: Who Will Make Sure The Internet’s Vast Musical Archive Doesn’t Disappear?.” By Ann Powers. NPR’s the record, 3 June 2015.